Home Feature: 'There's Skiing in Japan?! Feature: 'There's Skiing in Japan?! That's the reaction I received from friends and family, when I announced a spur of the moment decision to set out in search of an epic powder experience in the land of the rising sun. The Island's of Japan are home to more than 500 ski resorts!! "Takusan no kona yuki" There's lots of Powder! That was the rumor anyway! I have to admit that I was skeptical from the beginning, I hadn't prepared properly for the journey I was about to embark on. After all, the reason I had chosen this as a work experience was because most of the girls in my Ski Resort Management class were going! The first 48 hours of my experience are distinct in my senses but blurry in my memory. Japan Airlines provided us with more Asahi Beer then we needed and an emergency exit seats far away from the rest of the passengers. Our high energy came to a crash as we made our way through customs at Narrita Airport near Tokyo. A polite mannered gentlemen; named Masataka San directed us to a futuristic looking tour van and informed us the six hour drive we would have to endure to reach our main destination. I remember drifting in and out of consciousness along the way. Rain poured from the dense fog filled sky line as endless lanes of mini cars inched forward in bumper to bumper traffic. The horizon was filled with jumbo-tron style billboards. 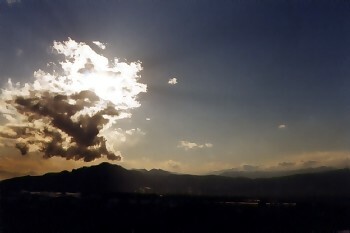 The humidity in the air and the wear and tear of the turbulent flight had drained me of all energy. The next conscious moment I remember is one that will be pasted in my memory for life. Groggy and jet-lagged, we arrived at the front desk of what seemed to be some random hotel. We were told to remove our shoes and slide into wooden slippers that were at least three sizes too small. I hobbled into a washroom that had awkward toilets that just seemed to be holes in the floor. The smell of the air freshener in that washroom was so pungent that it struck an immediate reaction from my gag reflex. This was the exact moment that reality set in and I pondered the thought, "What in the hell have I gotten myself into?" Katashina Kogen Ski Resort would be our home for the next six months. Heads turned amongst the locals as a fresh batch of Canadians rolled into town. We were the third consecutive set of International Resort and Hospitalities Study Program students to work a winter season at this particular resort. The beginning was obviously tough being so un-prepared. As time passed, I became more comfortable with the surroundings. The change in diet was difficult to adjust to; we frequented McDonalds and became huge fans of their Teriyaki Burger! Things were running smooth with the exception of one major factor, NO SNOW! Katashina opened for weekend operation just prior to Christmas with a single run barely covered in artificial snow. Drastic times call for drastic measures and with the lack of snow a meeting was held at a shrine at mid-mountain. Locals that included the equivalent to a towns Mayor and the owner of the ski resort congregated to pray to the Gods for snow. Katashina closed the next day and the Gods answered with more than a meter and a half of pure Japanese powder falling in just over 48 hours. The Japanese Winter season had arrived with a vengeance and it wasn’t about to let up. I spent my days loading lifts, studying language and culture, and shredding deep Nihon powder! Nights were spent drinking fine beverages, enjoying Japanese cuisine, and living the rock star's dream through the lyrics of the Beatles at local Karaoke pubs. In Japan, snow falls from the heavens like nothing I've ever seen. Consistent huge snowflakes blanket the mountains for days on end. The result is always a few meters of fresh powder. I only spent a single season in Japan. I can't be sure that every Winter is as deep as the one I enjoyed, however if you check out www.snowjapan.com you'll see that most resorts have much more snow than the Canadian resorts at this point. The groomers at our resort had it in their heads that snow was not to accumulate. Literally seconds after a snowflake made landfall, it was pressed into corduroy. The protocol for grooming seemed to be much the same for all of the resorts throughout Gunma Prefecture. As is, this left all lift lines and treed areas buried in untouched deep snow. 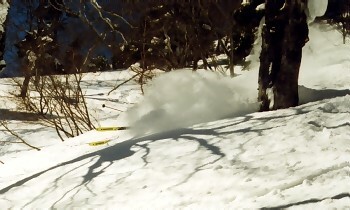 Tree skiing and skiing out of bounds is not yet accepted in most areas of Japan. 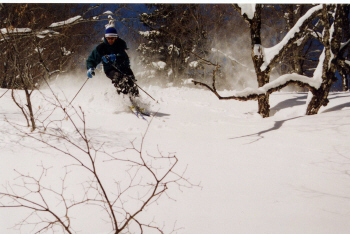 The forest is considered to be a sacred and spiritual place, however tree skiing continues to grow in popularity mostly in the North Island of Hokkaido. I managed to catch the odd local making turns in the forbidden areas in Gunma. On nights before our days off we drank copious amounts of our favorite mixed concoction which consisted of an alcohol called Shochu and a carbonated pop called Calpis. While intoxicating ourselves, we planned covert operations to neighboring mountains that included skiing areas that were always fresh and completely untouched. We named entire mountains with runs such as: Ska Ridge, Pungii Sticks, Bonzai Trees, Kamikaze Chutes, Lift'o Six'o, and Sushi's Roll. It was our own lift accessed resort. Disobeying our supervisors and skiing in these closed areas was sometimes hard to justify. Being caught would have meant a quick flight home and bringing shame to not only ourselves but our gracious hosts who were becoming great friends. Everyone knows there are no friends on a powder day and everyday seemed to be one of those. The addiction of sneaking into and out of our these sanctuaries was too overpowering. Our night missions became notorious throughout the community of Katashina. We would make continuous sled drops, shredding all of the resort's lift lines. Come morning, rumors would be flying around the mountain about how someone had skied where they shouldn’t have. "It has to be the Canadians!" they claimed. Somehow an alibi of us drinking beer and signing karaoke always checked out thanks to a few good pals! Being a photographer, I was stolked to catch the entire experience on film but the truth is that I ditched my camera 95% of the time which I now regret. 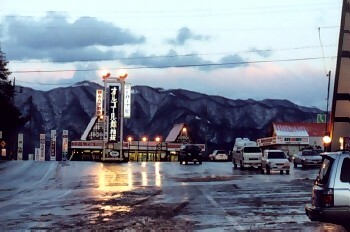 There were days that were a little too warm and the snow would turn to heavy slop by mid-day but I spent most of those days traveling to different Onsen's or checking out the cool architecture in the area. 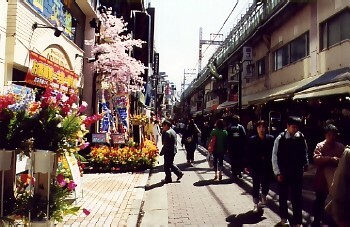 Spending what little time I did in Japan, it was a life altering experience. Talking to Japanese elders I found That some people had lost faith in both their government and their beliefs since the devastation of World War Two. The younger generation seems to be infatuated with technology and style. American culture has influenced the Japanese market, most of the clothing I found had some sort of mistranslated English slogan on it. Almost all of the people we met welcomed us with open arms and were very gracious. There was little crime and traveling alone was always a safe and exciting experience. My Japanese excursion was one I'll never forget. I have promised myself and friends that I will return to shred another winter. The experience is definitely one to consider. The people are fantastic, the food is unique and the snow is deep. Bryan is from Ontario, Canada and has been living in Nelson BC for about five years off and on. He works for Whitewater Ski Resort, and is a correspondent with biglines. He's looking forward to making it back to Japan soon, but for now content skiing DEEP Kootenay Powder!